Postal History involves not only the stamp itself, but the study of postal rates, routes and postal markings. Postal History uses the entire envelope (called a “cover”) to classify the item for organizational purposes. Below are examples of several different kinds of covers, all popular with collectors. Postage stamps were not introduced until the mid 1800’s, the first American postage stamps were issued in 1847. Covers from the pre-stamp period are logically called “stampless covers”. 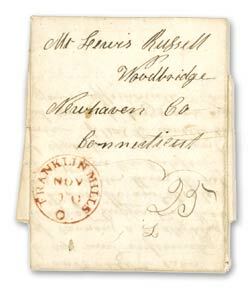 This cover was mailed from Franklin Mills Ohio (now part of Kent) on November 10, 1839. Philatelists call this a “stampless folded letter” because the outside of the cover was made by folding the letter up and sealing the back with wax. Envelopes did not come into widespread use until the 1850s. The handwritten “25” in the lower right corner is the cost of sending the letter, and was applied by the postal clerk. 25¢ in 1839 could represent an entire day’s wages for a day laborer! Airmail covers are covers that were carried by airplane in an effort to speed their delivery. Previously all mail went by land or sea. Airmail was introduced in the United States in 1918, and cost many times what the normal surface rate cost. This Airmail cover was sent from the REO Motor Car Company in Lansing Michigan. The cover is postmarked 1PM on Aug 21, 1928, and has a backstamp that shows it was recieved in Akron, Ohio 17 hours later; the next day, at 5:30AM, Not bad service! Advertising covers have some sort of printed design on them that relates to the sending company. This was seen as an easy way to advertise a companies wares, and were at one time very common, and are sometimes exquisite examples of the printer’s art. Slogan cancels are cancellations that urge some action on the part of the recipient. Everyone is familiar with the “Mail Early for Christmas” slogans that appear on mail during the holiday season. This cover is from Ireland, and bears the slogan cancel urging everyone to “use the Telephone”. 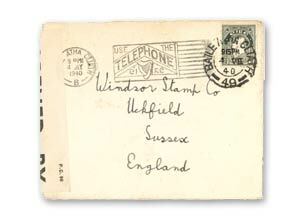 Sent during the early days of World War II from Dublin to Sussex in England, the cover has been Censored and has the Censor tape (used to re-seal the envelope after opening by the censor) down the left edge of the envelope.